After years of hemming and hawing, I mustered up the courage to cut the cord last year, and I’m happy I did—not just because of the freedom from my cable carrier, but also for the $100 a month my family gets to save. I’m still paying about $55 a month for broadband cable Internet access, mind you, but I turned in my DVR and costly cable TV subscription in favor of Netflix, Amazon Prime, iTunes and other streaming video services. And what about for live network TV, you ask? 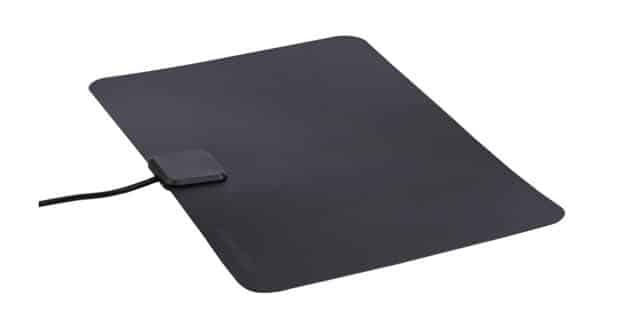 I get it all for free, over the air, with a handy dandy indoor HDTV antenna like this one. On sale for $10, the Channel Master Flatenna (which got a nod from The Wirecutter) is a so-called “leaf” antenna, just like the one I use in my Brooklyn basement. Just connect the Channel Master (also available in white) to your HDTV using the included cable, hang the antenna up on a wall or near a window, and after some trial and error (placement and orientation are key when it comes to reception), you’ll start pulling in razor-sharp local HDTV stations. Check out the Channel Master Flatenna on Amazon! If you buy something through our Deals posts, we may earn some money. Thank you for your support! HDTV tip: I’m cutting the cord. Do I need an HD-ready antenna?